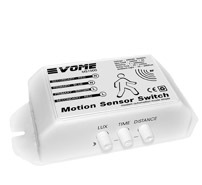 VOME MS1000 Motion Sensor Switch is an active motion detector with integrated high frequency microwave motion sensor. Unlike passive infrared-red(PIR) motion detector which looks for body heat, microwave sensor sends out microwave pulses and measure the reflection off a moving object. Fully concealable behind false ceiling, wood, glass panel, parition walls except metallic materials. No more dreadful sensor mounting and lamp or appliances are automatically switch-on when motion is detected. Simplifying home automation and complementing energy saving.